The coal based direct reduction rotary kiln process was developed for converting iron ore directly into metallic iron without the melting of the materials. The process has the advantage of low capital expenditure and no requirement of coking coal. The metallic iron in this process is produced by the reduction of iron oxide below the fusion temperature of iron ore (1535 deg C) by utilizing carbonaceous material present in the non-coking coal. As the iron ore is in direct contact with the reducing agent throughout the reduction process, it is often termed as direct reduced iron (DRI). The reduced product having high degree of metallization shows a ‘honeycomb structure’, due to which it is often called sponge iron. Coal based DRI plants are flexible with respect to plant location since non-coking coal is widely distributed in large deposits and is easy to transport. Most plants employ reduction process which is carried out in rotary kilns. These plants use wide variety of raw materials and non-coking coal. The quality of these materials has direct bearing on the process as well as the product. Some plants do not use iron ore directly. These plants use iron ore pellets in the rotary kiln. Raw material mix consisting of iron ore, dolomite and non-coking coal is fed at the one end of the rotary kiln and is heated by coal burners to produce DRI. The product DRI along with char (sometimes called dolo char) is taken out from the other end of the kiln. Apart from this, primary air and secondary air are supplied to the kiln to initiate the combustion and sustain the reaction process in the kiln. Iron ore of the right quality is the basic input for the coal based direct reduction process. Most of the coal based direct reduction plants use lump iron ore. The main quality requirements are (i) high Fe content with less gangue and deleterious elements like phosphorous and sulphur, (ii) good handling properties (tumbler index and abrasion index), (iii) calibrated to size with less fines, (iv) high reducibility, (v) low decrepitation during reduction, and (vi) good compatibility with the reductant coal used. The quality requirement of sized iron ore is to meet physical, metallurgical, and chemical requirements. Physical requirements are strength and granulometry. The ore is to be hard, and possess high strength. The optimum tumbler strength of the ore is to be 90 % minimum. Depending on the reducibility, calibrated ore in the size range of 5 mm to 20 mm is generally used. Metallurgical requirements of the ore include high reducibility, thermal stability, and a low tendency for sticking and disintegration during heating and reduction. Chemical requirements of the ore is an important characteristic since apart from the removal of oxygen, no other chemical change takes place during the direct reduction process. The gangue material in DRI, originating from the iron ore, namely, silica and alumina along with sulphur and phosphorous contents adversely affect the economics in subsequent steelmaking operation. Hence, the ore is to be high in iron content and low in gangue. The desired physical and the chemical specifications of the ore are as follows. Non-coking coal used in rotary kiln has dual role. It supplies heat for the process and also acts as a reducing agent. The major quality requirements of the non-coking coal are (i) non-coking characteristics, (ii) low ash content, (iii) low sulphur content, (iv) good reactivity, (v) high ash fusion temperature, and (vi) medium volatile matter. Non-coking character of the coal is necessary since the coking reaction leads to formation of rings inside the kiln. Practically permissible caking index limit for the rotary kiln process is 3 maximum. Low ash content of the coal is necessary since the high ash leads to under-utilization of the kiln volume available for reduction. It also increases the consumption of fixed carbon since additional energy is consumed in heating the inert ash mass to reaction temperature. An ash content of 20 % maximum is the practical limit for efficient operation. Low sulphur content is required to control the sulphur in the DRI. The sulphur in the coal is to be 0.01 % maximum. Good reactivity of the coal is needed since an important step in solid state reduction process is the forward reaction, whereby carbon dioxide generated from burning of coal reacts with coal to regenerate carbon monoxide (Boudouard reaction). Hence, the coal is to possess sufficient reactivity so that the Boudouard reaction proceeds at the desired rate. Bituminous and sub-bituminous coals show usually good reactivity suitable for production of DRI. Ash fusion temperature is another important characteristic. Coals having low ash fusion temperature leads to sticky mass resulting into unstable kiln operation due to the formation of the accretions inside the kiln which reduces the reduction rate by formation of slag layer on surface of the ore. Hence coals with ash fusion temperature higher than 1400 deg C are desirable for rotary kiln operation. 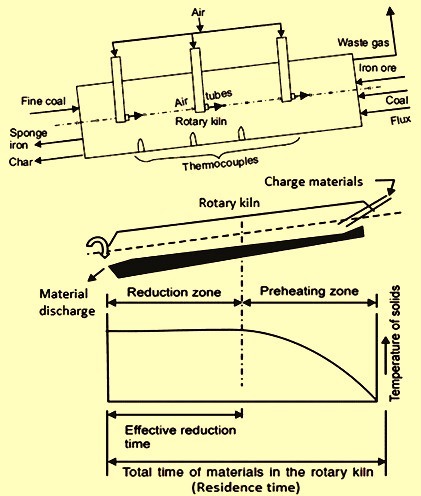 Volatile matter of the coal is to be optimum for coal based rotary kiln process. Coal with very low volatile matter result in very low reactivity of char, and thus give rise to poor metallized product. Very high volatile coals, though yield highly reactive char, are also not preferred since it increases gas volume in the kiln. Normally for rotary kiln process volatile matter is to be in the range of 25 % to 30 %. Coals for direct reduction in the rotary kiln need to have low swelling index. Normally swelling index is to be less than 1. The physical and chemical specifications of the non-coking coal are as follows. Dolomite is used for desulphurization in the DRI production process. Typical specification of the dolomite is given below. Chemical reactions take place inside the rotary kiln. The cross section of the rotary kiln is at Fig 1. Coal based direct reduction process is based on the solid reducing agent which is non-coking coal. The reaction takes place at high temp (1000 deg C to 1100 deg C). Coal plays a dual role in the kiln. Part of coal is used as fuel to supply the desired heat so as to take the raw materials to the desired temperature. But main role of coal is to supply carbon for the reduction process. Dolomite is used as sulphur scavenger which finally comes out with the char. Char contains ash of coal and other impurities of iron ore. The reactions inside the kiln take place in several stages during the reduction of iron ore to DRI. Iron ore undergoes the following final reduction reaction. The reaction shows that the carbon monoxide (CO) is reducing gas which is obtained by controlled combustion of coal, according the Boudouard reaction as given below. The carbon monoxide produced as above reduces iron oxide of iron ore to metallic iron as per the reaction given above. However, the reduction from oxide to metal does not take place in one step, but by gradual removal of oxygen giving, rise to various intermediate oxides. The reduction sequence can be expressed as Fe2O3 to Fe3O4 to FeO to Fe. The reaction occurring inside the bed of iron ore and coal are heterogeneous in nature. Two sets of reactions take place. The first set of reactions takes place between coal, carbon dioxide and oxygen while in the second set the reactions are between iron ore particles and CO. Since oxygen of the iron ore gets removed as CO2, escape of CO2 gas makes the product DRI porous. Reaction between the ore particle and the gaseous reductant can be visualized to occur in the following five successive stages. Stage 1 – In this stage diffusion of gaseous reactant takes place through the film surrounding the ore particle to the surface of the solid. Stage 2 – In this stage, penetration and diffusion of the reactant through the blanket of the reacted outer layer takes place to the surface of the unreacted core. Stage 3 – In this stage, reaction of gaseous reactant takes place with solid at the reaction surface. Stage 4 – In this stage diffusion of gaseous products takes place through the reacted layer to the exterior surface of the solid. Stage 5 – In this stage diffusion of gaseous products through the gas film back to the main body of the gas. Since the reaction takes place in several stages and each stage in succession, the stage with the least rate controls the rate of the reaction. Both the diffusion rate and the reaction rate are primarily a function of the three parameters namely (i) concentration of reactants, (ii) active interface temperature, and (iii) active area of reaction. The process of direct reduction is carried out in a rotary kiln where the operating temperatures are maintained in a range from 1,000 deg C to 1,100 deg C. The product of the kiln (DRI and char mix) is then cooled in a rotary cooler with external water cooling system. The products of the kiln is screened and magnetically separated. DRI being magnetic gets attracted and gets separated from non- magnetic char. The iron ore and coal crushed and screened to respective sizes are fed to rotary kiln through feed tube in pre-determined ratio. The rotary kiln is slightly inclined at an angle 2.5 degree and rotated by AC variable speed motor at a variable speed ranging from 0.2 rpm (revolutions per minute) to 1.0 rpm. Due to inclination and rotary motion of the kiln, the material travels from feed end to the discharge end of the kiln in around 7 hours to 8 hours. The coal fine is blown from the discharge end for maintaining the required temperature and the carbon concentration in the bed. The kiln has several shell air fans mounted on the top which blow air in the respective zones to maintain the required temperature profile. The material and the hot gases move in the counter current direction, as a result the iron ore gets pre- heated and is gradually reduced by the time if reaches the discharged end. 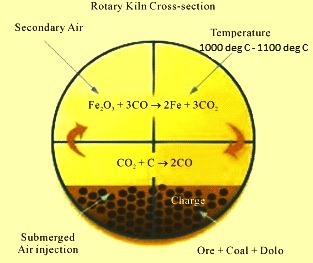 The rotary kiln is broadly divided into two zones namely the pre-heating zone and the reduction zone (Fig 2). The pre-heating zone extends over 40 to 50 percent of the length of the kiln. In this zone, the moisture in the charge is driven off, and the volatile matter in the coal, liberating over a temperature range of 600 deg C to 800 deg C, is burnt with the combustion air supplied through the air tubes in the free space above the charge. Heat from the combustion raises the temperature of the lining and the bed surface. As the kiln rotates, the lining transfers the heat to the charge. Charge material, pre-heated to around 950 deg C enters the reduction zone. Temperature of the order of 1000 deg C to 1100 deg C is maintained in the reduction zone, which is the appropriate temperature for solid-state reduction of iron oxide to metallic iron. Thermocouple installed along the length of the kiln shell determines the thermal profile of the kiln. The temperature inside the kiln is controlled by regulating the amount of combustion air admitted into the kiln through ports with the help of fans mounted on the kiln shell and by controlled coal injection. The iron oxide of the ore is reduced to metallic iron by carbon monoxide generated in the kiln from coal. The hot reduced material from the kiln then passes to the rotary cooler though transfer chute for cooling. The cooler is also inclined at 2.5 degree and is rotated of a variable speed of 0.3 rpm to 1.2 rpm driven by an AC variable speed motor. Water is sprayed on top of shell to cool indirectly the hot material inside the shell. The material is cooled to around 100 deg C and is discharged on the belt conveyor through a double pendulum valve, which acts as a seal and prevents the atmospheric air to enter into the rotary cooler. The cooled product of the kiln after its discharge from the rotary kiln is sent to the product separation area where the DRI is magnetically separated from the char and is screened to various size fractions. Gases flowing in counter current direction to material in the kiln travel to the dust settling chamber (DSC) where heavier particles settle down. These particles are continuously removed by the wet scrapper system. The gases then pass to the after burner chamber (ABC) where the residual carbon or CO is burned by the excess air available. After ABC, the gases are at high temperature and have a lot of heat energy which is normally utilized for steam generation through the waste heat recovery boiler (WHRB). This steam is generally used for power generation. Gases cooled to around 200 deg C at the WHRB discharge travel to pollution control equipment such as bag filters, scrubber, or electro static precipitator (ESP) for removal of the finer dust particles. The clean gases are let of to the atmosphere at around 80 deg C through the chimney. For avoiding significant formation of the kiln rings, the operating temperatures in the kiln are to be maintained within a temperature of 1,100 deg C.
Since the rotary kiln process requires around 7 hours to 8 hours of reduction time, the productivity of the process is limited and is usually in a range between 30,000 tons/year to 150,000 tons/year depending on the kiln size. Important stages of the process and the process concept are shown in Fig 2. Further in the coal based rotary kiln reduction process around 6 GCal of fuel energy is required. More than 2 GCal of energy is let out from the kiln as waste gas. Part of this energy is recovered in the WHRB. 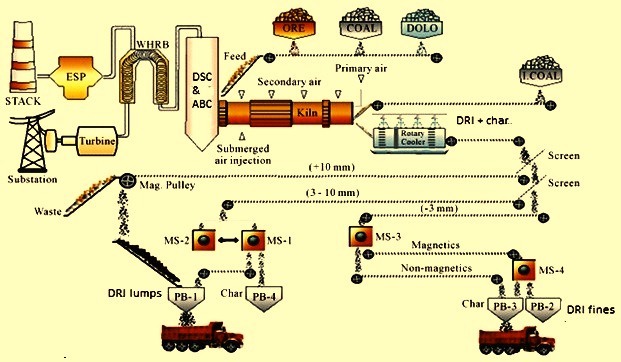 A typical schematic flow sheet of coal based direct reduction process is at Fig 3. There are several processes and process concepts which have been developed in this area during the second half of the twentieth century. Some of them have survived while others have not. The processes and process concepts which have survived have several common or slightly differing features as given below. A method of sealing to avoid entry of air into the rotary kiln. A method of throwing or slinging non-coking coal from discharge end of the rotary kiln. A method of weigh feeding, proportioning and charging of raw materials. A method of introducing controlled quantity of air at regular intervals along the length of the kiln in such a way that it does not oxidize the reduced product in the bed. A method of measuring and recording the temperature at regular intervals along the length of the kiln. A method of indirect cooling of DRI – char mixture in a rotary steel cylindrical shell by spraying of water on the shell outer surface. A method for the separation of DRI from DRI-char mixture. A method of treating waste gases and maintaining desired flow profile through pressure control. The following equipments and facilities are needed for the coal based direct reduction rotary kiln process. Raw material preparation section – This section contains equipments such as vibro-feeders, crushers and screens. Iron ore crushing is normally not needed since sized material (5 mm to 20 mm) is generally procured. Iron ore is usually taken to the ground hopper, from where it conveyed to the screen with the help of vibro-feeder, where oversize (+ 20 mm) and undersize (- 5 mm) is separated by screening. The oversized material is conveyed to the oversize crusher to get sized material. In case of non-coking coal, the received size is normally -200 mm which is crushed with the primary and secondary crushers in closed circuit with primary and secondary screens. The screens separates the two fractions namely coal lumps for feed coal (5 mm to 20 mm) and coal fines (-5 mm) for injection coal which are needed for the process. Dolomite crushing and screening is generally not needed since the sized material (3 mm to 8 mm) is generally procured and directly fed to the day bin through conveyor. All the raw materials from their discharge points are fed to the day bin through conveyors. Raw material storage section – It consists of storage bins (day bins). For different raw materials, separate storage bins are provided. The bins are normally designed for the storage of raw materials for minimum of one day consumption. Raw material feeding system – It consists of weigh feeders which are provided below each bin to draw various raw materials in the required proportion from the bins and deliver to the conveyors for feeding into the kiln. Rotary kiln – It is the heart of the coal based reduction process since the reduction reaction takes place in this reactor. The diameter and the length of the kiln depend on its capacity. The kiln is generally lined with high alumina castable refractories throughout its length with dams at feed end and discharge end. The kiln is usually inclined at 2.5 degree downward slope and rests on two to four support stations, depending on the kiln size. The transport rate of materials through the kiln can be controlled by varying its slope and speed of rotation. There are inlet and outlet cones at opposite ends of the kiln which are cooled by its individual fans. The kiln shell is provided with small sampling ports. The longitudinal positioning of the kiln on its riding rings is controlled by hydraulic systems. The coal and iron ore are metered into the high end of the inclined kiln. A portion of the coal is also injected pneumatically from the discharge end of the kiln. The burden first passes through a pre-heating zone where coal de-volatilization takes place and iron ore is heated to pre-heating temperature for reduction. Temperature and process control in the kiln are carried out by installing suitable numbers of air injection tubes made of heat-resistant steel spaced evenly along the kiln length and countercurrent to the flow of iron ore. Tips of the air tubes are equipped with special internal swirlers to improve uniformity of combustion. A central burner located at the kiln discharge end is used with LDO (light diesel oil) for heating the cold kiln. After initial heating, the fuel supply is turned off and the burner is used to inject air for coal combustion. The kiln temperatures are measured with fixed thermocouples and ‘quick response thermocouples’ (QRT) ports. Fixed thermocouples are located along the length of the kiln so that temperatures at various sections of the kiln can be monitored. Fixed thermocouples, at times can give erratic readings in case they get coated with ash, ore or accretion. In such cases QRT are used for monitoring the kiln temperatures. Rotary cooler – The product (DRI) along with coal ash, calcined dolomite and residual char is discharged from the kiln at around 1000 deg C. An enclosed chute at the kiln discharge end equipped with a lump separator and an access door for removing lumps transfers the hot DRI to a rotary cooler. The cooler is a revolving cylinder of appropriate size which is inclined at 2.5 degrees. The DRI is cooled indirectly by water spray on the cooler upper surface. The cooling water is collected in troughs below the cooler and pumped to the cooling tower for recycling along with make-up water. Solids discharged to the cooler through an enclosed chute are cooled to around 100 deg C without air contact. A grizzly in the chute removes accretions that are large (larger than 50 mm) to plug up or damage the cooler discharge mechanisms. These accretion lumps are discharged separately via lump gate. Rest of the material is discharged on a conveyor via double flap valve. The product is then conveyed to the product separation system through conveyor. Product separation section – It consists of vibrating screen and magnetic separators. The cooled product is conveyed to the product separation section by belt conveyors. The products from the cooler discharge contain DRI, char and coal ash. In the product separation building, the product is first screened in a double deck screen having 3 mm and 20 mm screens. The screened product is being fed to magnetic separators for separation of magnetic and non-magnetic portions. The product is screened first to remove the plus 20 mm DRI. The undersize (a mix of DRI, char and coal ash) is screened into +/- 3 mm fractions. Each fraction passes through a magnetic separator. The non-magnetic portion of the plus 3 mm fraction is mostly char which can be recycled to the kiln if desired or can be used in power plant boiler as fuel. The nonmagnetic portion of -3 mm fraction mostly spent calcined dolomite, ash and fine char is discarded. The magnetic portion of each fraction is DRI. The plus 3 mm fraction can be used directly for steelmaking and the finer fraction can be briquetted and collected in bags. Product storage section – It consist storage bins. DRI lumps (3 mm to 20 mm) and DRI fines (-3 mm) are stored in different storage bins. Bins are normally designed to have storage of minimum 1 day production. Char generated in the plant is stored separately for use as fuel in the power plant. Waste gas system – The kiln waste gases at temperature of around 850 deg C to 900 deg C pass through a dust settling chamber where heavier dust particles settle down due to sudden decrease in velocity of gases. The flue gases then pass through an after burning chamber where un-burnt combustibles are burnt by blowing excess air. The temperature of the after burner chamber, at times, is controlled by water sprays. The burnt gases then pass through a down duct into evaporation cooler where the temperature is brought down and through pollution control equipment namely ESP / bag filter/ scrubber where balance dust particles are separated. Then the gas is allowed to escape into the atmosphere through stack via induced draft (ID) fan. However, it is desirable to equip the waste gas system with waste heat recovery boiler (WHRB) for the recovery of sensible energy carried by the waste gases. In this case the flue gases after the after burning chamber pass through an elbow duct to WHRB where sensible heat of the gases is extracted. The gas is then let off into the atmosphere after passing through pollution control equipment like ESP /bag filter / scrubber, ID fan and stack. Supply of utilities – Compressed air and cooling water are the two utilities needed for the process. Air compressors are normally installed for supply of compressed air while for cooling water system consists of pump house and cooling tower. Material inside the kiln tumbles and slides, and a thin layer of dust invariably forms on the surface of the refractory lining. Some zones of the kiln may be specifically prone to particle accumulation and the combined effect of thermal and flow conditions results in the formation of cylindrical deposits, or rings due to its rotating motion. As the ring grows thicker, the available opening of the kiln is decreased, i.e. the working volume of the kiln is decreased, resulting into the hindering of the flow of product and flue gasses through the kiln. Rings are generally situated close to the reduction zone or burner and are caused by the very high temperature in this area, particularly when the refractory lining is overheated due to direct impingement of the burner flame. These are the most common and also the most troublesome type of rings. The principle reason for accretion formation in rotary kilns is due to the formation of low melting complex compounds in the FeO-SiO2-Al2O3 system, such as wustite, fayalite, iron cordierite, hercynite, and in the CaO-MgO-FeO-SiO2-Al2O3 system, such as melilite or anorthite, akermanite, iron-magnesium cordierite, spinel, and iron-magnesium silicate. The coexistence of these complex compounds decreases the fusion temperature of the kiln charge, which in turn adheres to the refractory walls. Some accretions are also formed because of agglomeration of fines nearer to the charge end or because of sintering of DRI owing to excessive temperature and/or lower carbon/iron ratio at the discharge end of a rotary kiln. Since these rings cannot be reached from outside of the kiln, they are therefore impossible to be removed during the working of the kiln. In several cases, rings grow rapidly and cause the unscheduled shutdowns of the kiln. It has been observed that majority of the shut downs of the kiln is only due to the formation of the accretions. Some of the terms associated with measuring the effectiveness of the reduction reactions for DRI are defined as follows.